Washington’s Branton Dawes (right) competes against an opponent at the bracket tournament at Washington High School Saturday, Jan. 26, 2019. Dawes won the 113-pound weight class. Washington’s Jacob Stone controls his opponent during a 106-pound match at the bracket tournament Saturday, Jan. 26, 2019 at Washington High School. Washington’s Collin George goes on the attack during a 120-pound bout at Washington High School Saturday, Jan. 26, 2019. 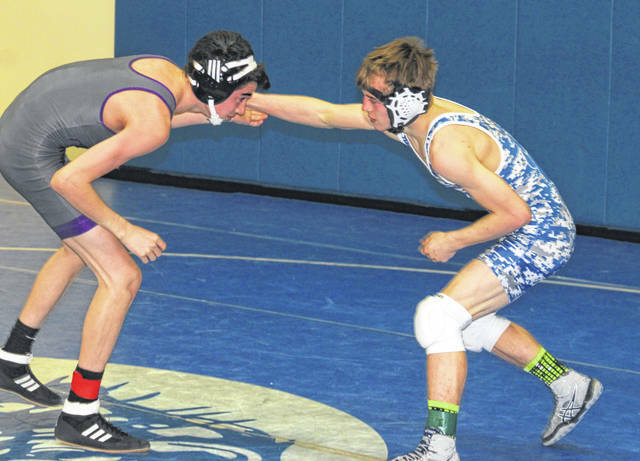 The Washington Blue Lions held a bracket wrestling tournament Saturday, Jan. 26. It is the seventh such tournament for the Blue Lions. The Blue Lions finished fourth out of 12 teams with 130 points. Pickerington Central won with 256 points. The McClain Tigers placed second with 166 points, followed by Little Miami in third with 156.5 points. Hamilton Township was fifth with 126 points. East Clinton placed eighth with 58 points. 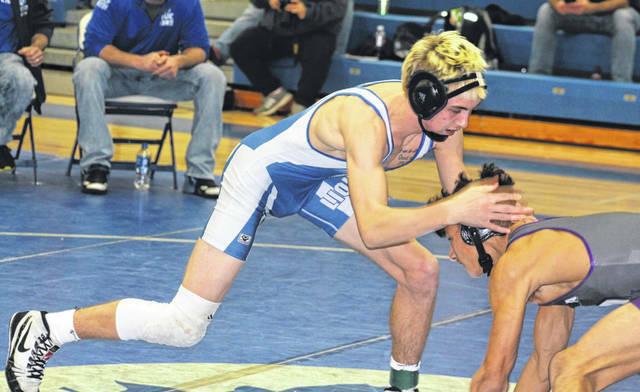 For the Blue Lions, Branton Dawes won the 113-pound weight class and Collier Brown won at 195 pounds. It was the first tournament win for Brown in his high school career, Reid said. It was the second tournament win for Dawes. “We hold this tournament to help prepare our wrestlers for the postseason,” Washington head coach Louis Reid said. “In general, I was really happy with the way we wrestled at this tournament. We wrestled really, really well. We were ninth at this tournament last year. “This was, I thought, Collin George’s best tournament of the year,” Reid said. “Sophomore Dylan Moore, he placed sixth; every match he wrestled really tough. “Collier Brown put together a whole tournament,” Reid said. “Offensively, he was constantly attacking his opponent. He just went out and took care of business. Dawes pinned Jarron Upperman of Pickerington Central in 1:13. He then pinned Caden Moore of Little Miami in 3:59. Dawes was recently voted the Max Preps Athlete of the Week. Brown began with a pin over Joshua McKibben of Williamsburg in 5:53. In his next match, Brown pinned Scott Rains of Norwood in 1:29. In the championship match, which went into overtime, Brown pinned Colin Streuer of Little Miami in 6:45. Mason Mustain placed second for Washington at 220 pounds. In his first round match, Mustain pinned Jayson Edison of East Clinton in 20 seconds. In the quarterfinals, Mustain pinned Cameron Griffith of Pickerington Central in 1:40. In the semifinals, Mustain pinned Gavin Barnhart of Williamsburg in 5:08. In the championship match, Kade Rawlins of McClain pinned Mustain in 5:30. Two Blue Lions (Jacob Stone at 106 pounds and Collin George at 120 pounds) finished in third place in their respective weight classes. In his first match, Stone lost a 9-2 decision to Jadon Worboy of Hamilton Township. In the match for third and fourth place, Stone won a 6-0 decision over his teammate, Bryce Warner, putting Warner in fourth place. In his first match, Warner was pinned by Kaleb Mangahas of Pickerington Central in 3:21. For George, in his first match, he won a 6-3 decision over Kyle Kinder of Springfield Northeastern. In his second match, George lost an 8-0 major decision to Bo Branson of Pickerington Central. In the consolation semifinals, George pinned Mehki Hargrow of Pickerington Central in 1:50. In the match for third and fourth place, George won an 8-2 decision over Caden Martin of Hamilton Township. Jay Fettig (160) and Chase Sluder (220) both placed fourth for the Blue Lions. In his first match, Fettig was pinned by McClain’s Caleb Goddard in 1:17. Fettig then had a pin of Mason McKee of Northeastern in 2:03. In the match for third or fourth place, Fettig faced off against Goddard a second time. Goddard won the match by pin in 2:00. For Sluder, he began with a 3-1 decision over Natt Sudhoff of Northeastern. Rawlins of McClain won a 14-0 major decision over Sluder in the semifinals. In the consolation semifinals, Sluder pinned Cameron Griffith of Pickerington Central in 2:40. In the match for third place, Sluder was pinned by Nate Sudhoff of Northeastern in 1:59. Will Baughn placed fifth for the Blue Lions at 145 pounds. Baughn’s tournament began with a match against Joseph Bechtol of Williamsburg. Baughn got the pin in this match in 4:22. Baughn lost an 8-3 decision to Romeo Gabriel of Hamilton Township. Baughn fell to Blake Benson of Pickerington Central by a 13-0 major decision in the consolation semifinals. In another match against Bechtol of Williamsburg, Baughn got the pin in 2:20, placing fifth. Dylan Moore placed sixth for Washington at 170 pounds. Moore began with a pin of Ethan Cramblit of Hamilton Township. The fall came in 23 seconds. In his next match, Moore lost to Dae Hargrow of Pickerington Central, 12-9. In the consolation semifinals, Moore was pinned by Sawyer Brancifort of Pickerington Central in 5:00. In the match for fifth or sixth place, Moore lost a 9-2 decision to Trenton Kellerman of Williamsburg. Austin Chamberlain went 0-2 on the day for Washington at 120 pounds. He was pinned by Caden Martin of Hamilton Township in 1:45 and then lost a 7-5 decision to Kyle Kinder of Northeastern. At 126 pounds, Jaedan Meriweather opened with an 8-5 decision loss to Chelsie Murray of Hamilton Township. Meriweather then defeated Dawson Malott of Williamsburg by a 4-3 score. Meriweather’s run ended with a 8-0 major decision to Gary Morris of Hamilton Township. Devin Slagle went 0-2 at 132 pounds for Washington. Slagle was pinned in his opening match by Cole Gintert of Little Miami in 2:34. In the consolation round, Slagle was pinned by Vianchi Banderas in 1:53. The Blue Lions will wrestle Gallia Academy in the Regional dual team tournament Saturday morning at the new Miami Trace High School gymnasium. Wrestling starts at 9 a.m. One of the 15 teams taking part will emerge as a Regional champion and qualify to the State quarterfinals Sunday, Feb. 10 at St. John Arena at The Ohio State University.